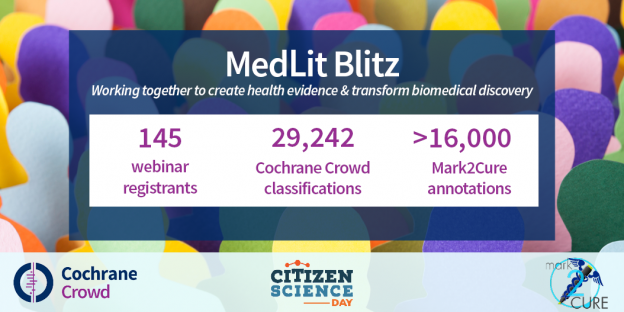 Student readers, do you realise that Cochrane’s citizen science platform Cochrane Crowd offers some wonderful and tangible benefits for students? By getting involved with Cochrane Crowd, you contribute to Cochrane’s mission of improving health evidence while at the same time adding to your student portfolio, improving your CV, earning Cochrane Crowd badges, working towards full Cochrane Membership, upskilling in health evidence and keeping abreast of the latest literature. Talk about an all-out win for everyone involved! Take a look at this 2-minute introduction to Cochrane Crowd and then read on for five benefits of joining Cochrane Crowd as a student. We know it’s important to build up your portfolio and CV, so once you’ve contributed 200 or more classifications to Cochrane Crowd you become eligible for a Certificate of Achievement. Since Cochrane is the global leader in health evidence synthesis, this is bound to impress, right!? Just email us at [email protected] once you’ve reached 200 and let us know you’d like a certificate. If you’re a die-hard Cochranite, you might know it’s possible to earn Cochrane Membership. 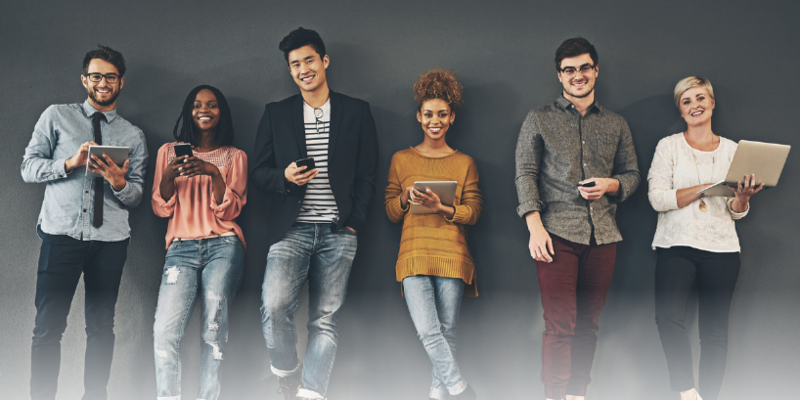 While everyone is invited to join Cochrane as a Cochrane supporter, once you’ve contributed in a substantive way you are offered membership, which allows you to vote in Cochrane elections, stand for internal governance positions – and let’s face it , would be another great addition to your student portfolio and CV. By completing 1,000 classifications across Cochrane Crowd’s key tasks, you’ll receive an invitation to become a Cochrane Member. You can read more about the Cochrane Membership scheme here and here. Anyone other than me enjoy prize incentives? Good. You’ll earn badges for every task within Cochrane Crowd: a green badge once you finish task training, bronze once you classify 100 studies, through to silver and finally a gold badge once you’ve completed 1,000 classifications. Exceptional members who are highly accurate will become tasks experts and receive purple badges. Full flush of purple, anyone? When you first join Crowd you have access to our beginner-level tasks. As you progress, more challenging tasks become available. We provide interactive training modules for each Cochrane Crowd task: you get immediate feedback as you progress through the exercises. You can monitor your accuracy on each Crowd task through the History and Settings buttons, accessible on your dashboard. Celebrate your accurate classifications, and learn from your mistakes. If you’re passionate about a particular health topic, you can focus on that topic in Cochrane Crowd. For each task simply go to the History and Settings button/Settings tab, and enter the topic under Prioritise Records I Receive. Et voila! You’ll be reading up on your favourite topic while screening for Cochrane Crowd. As if all that wasn’t enough, two further developments in Cochrane Crowd that we hope will appeal to students are coming soon. The first is called Screen4Me. 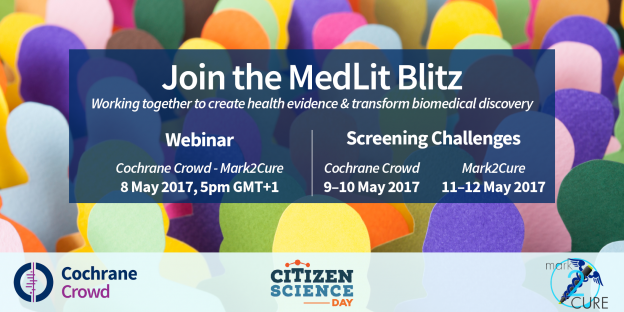 This is where Crowd contributors can get involved in helping screen search results for specific Cochrane reviews. We hope to launch Screen4Me by the end of the year! The second is a student pathway designed especially for studentsmade up of Crowd tasks in combination with more traditional learning modules, guiding students through a range of topics and activities from understanding study designs and PICO, through to critical appraisal and nitty gritty statistical issues. So, what are you waiting for? Hop over and join Cochrane Crowd here. 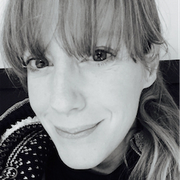 Anna Noel-Storr is the Information Specialist for the Cochrane Dementia and Cognitive Improvement Group and also works on a number of projects including Cochrane Crowd. If you love Crowd and think it would work for your course why not tell your lecturer about Cochrane Classmate? In Classmate, they’ll be able to set up Crowd challenges where you and your classmates collectively screen as much as possible in a set period of time. Believe us, it’s lots of fun! And if you’re interested in contributing directly to Cochrane systematic reviews, you might also like to take a look at Cochrane’s TaskExchange platform: look out for the green leaf tasks specifically aimed at evidence newcomers! 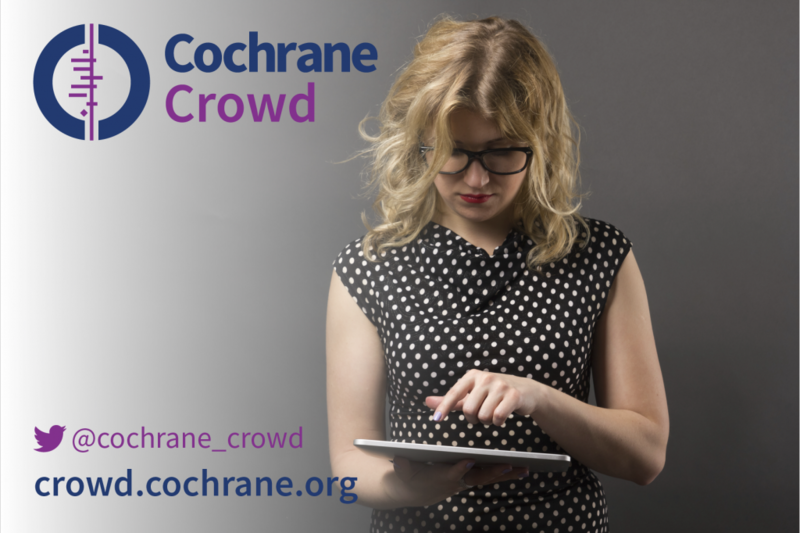 Sign up to Cochrane Crowd, follow us on Twitter and contact us at [email protected].